In this rapidly changing nature venue of late April and May (Swallow-tailed Kite! Parasitic Jaegers in the rips! Breeders at Belleplain! 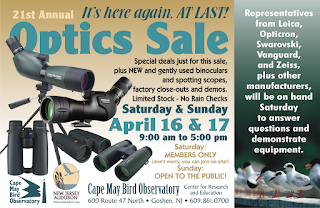 ), New Jersey Audubon's Nature Center of Cape May and Cape May Bird Observatory still have more mundane but still important work to do. Above, Gretchen details the value of volunteers, who did yeoman work at both the nature center and at the CMBO Northwood Center, where you can explore our newly created birding trail. I love this time of year. Every day there's a new bird. Early this morning, I cruised the streets of Cape May Point, NJ with the windows open (an excellent strategy to start your Cape May day, by the way) and discovered that House Wrens had returned in force since I'd been down here three days ago. I then joined my friend Tom Reed at his spring watch from the dune crossover at Coral Avenue, where among many other things we saw a flock of 61 Glossy Ibis come in off the bay, a flock of dowitchers fly into the bay, and many Northern Gannets, although that species' peak has come and gone. There are still plenty of gannets, don't get me wrong, so if you want to catch the show, go to a dune overlook and watch, or get on the ferry. My personal songbird highlight of the week was a singing Cerulean Warbler on April 18 at Cox Hall Creek WMA. Cerulean is very scarce bird in Cape May, and has declined throughout its range, and I believe this was also the earliest arrival date ever recorded for the species by several days. Birds happen, and with climate change, they are going to happen more. Another change factor is simply that bird ranges are not static; the range maps in old field guides in many cases are no longer accurate. Case in point is Common Raven, at least one of which has been haunting the Rio Grande, NJ area for weeks. A best guess is that there is some form of a cell phone tower that this bird (or birds) is using, since that is where the species now mostly nests in northern NJ. Warblers and butterflies are now readily available in Belleplain State Forest, and shorebirds are filtering into Heislerville and elsewhere. Like I said, I and all naturalists love this time of year. . .which is why CMBO offers such a large suite of spring field trips and events. We've got a lot going on this spring and I'd like to bring three important items to your attention to ensure you're in the know. 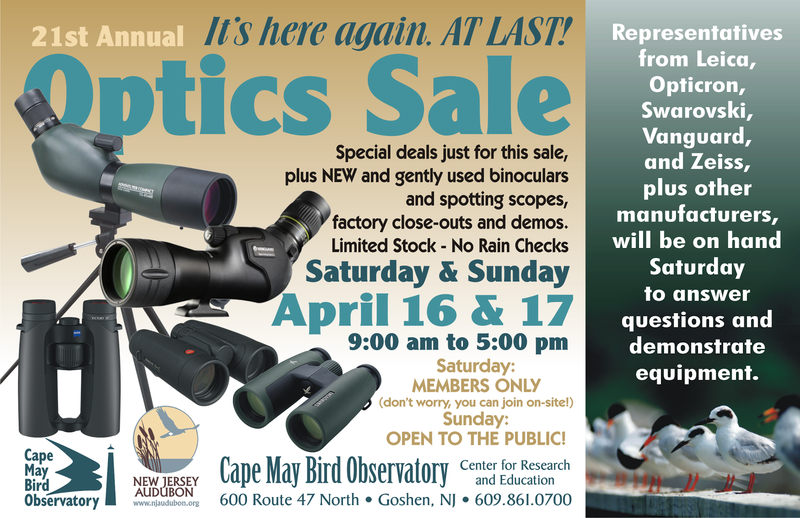 First off, tomorrow and Sunday (4/16-17) we will be holding our 21st Annual Cape May Optics Sale at our Center for Research and Education. If you come, you’ll receive one-on-one service to help you choose the best optics for your budget and needs and our staff and volunteers look forward to serving you. Doors open at 9am; I’ll be there at 8am serving fresh brewed Birds & Beans bird-friendly coffee so come early and secure your spot in line! Personal attention, optics experts, and all profits go to supporting our conservation mission. How can you beat that? Second, May 14th is the 33rd Annual World Series of Birding. You can get more information at worldseriesofbirding.org but if you’ve been thinking about fielding a team let me tell you this is the year to do it! We’ve recalculated our Limited Geographic Area (read: counties) PAR system to reflect current bird distributions, we’re rolling out the World Series of Birding App for entering your checklist on game day, complete with photo uploads for documentation, and some other great bells and whistles. I know you’re going to love it! We have moved the Photo Big Day to Saturday April 30th from 9am - 9am (the following Sunday) which does two things: first it allows you to compete in both the Photo Big Day and WSB, and it also gives you more shooting hours so Photo Big Day participants can actually cover the entire state in 24-hours. Check out our website for more details, and if you’re interested feel free to contact lillian.armstrong@njaudubon.org for additional information. I remember reading Jack Connor’s Season at the Point: The birds and birders of Cape May back when I was a graduate student at Rutgers University. My friend, and fellow Floridian, Jeff Bouton was featured prominently, and the cast of characters throughout the book were familiar (although only tangentially at the time): Pete Dunne, Vince Elia, Pat and Clay Sutton, Paul Kerlinger, Richard Crossley. At the point of reading the book I didn’t know I’d end up living in Cape May, and certainly didn’t know I’d become the director of CMBO. What I did know, though, was that Cape May was a special place and this book ported me to that world in vivid detail. If you haven’t read it, I highly recommend it. 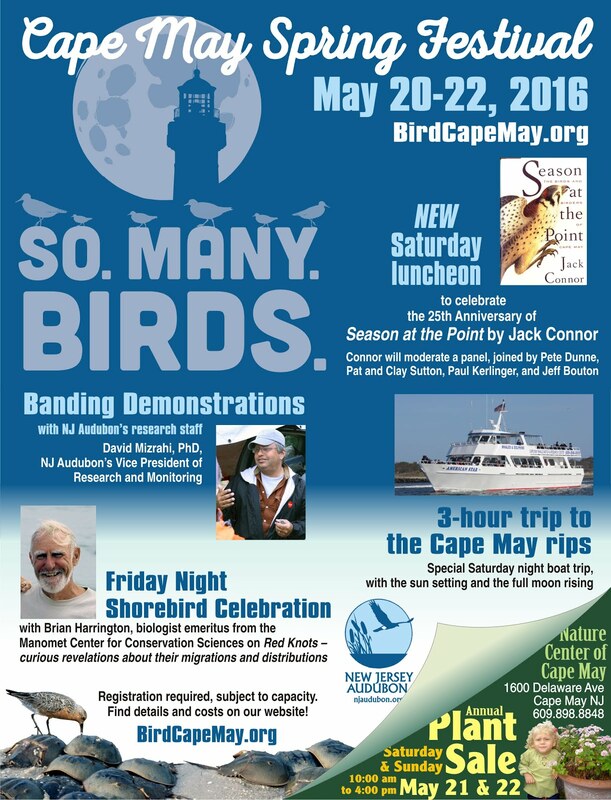 From all of us at New Jersey Audubon’s Cape May Bird Observatory, we look forward to seeing you in Cape May soon! The Gannet "Thing" IS On! A flock of over 1,000 Northern Gannets was a nice way to come down from a week in Eilat, Israel, where the Leica Cape May Bird Observatory American Dippers (me, captain Doug Gochfeld, Ben Barkley, and Tom Reed) competed in the Champions of the Flyway event. More on that later. For now. . .there are a LOT of birds migrating through Eilat right now. Like, we saw over 3,500 raptors of ~ 10 species (Steppe Buzzards, Steppe Eagles, Pallid Harriers, Imperial Eagles, Egyptian Vultures. . .) in a half hour of watching in the Eilat mountains. This would be a very good weekend to ride the Cape May-Lewes Ferry to watch gannets, scoters, and Red-throated Loons.